The hotel is located in Massa Lubrense-Sorrento Coast, in an area of unspoilt natural beauty characterised by its mild climate, century-old olive and citrus groves and enjoying fantastic panoramic views of the Gulf of Naples and the island of Capri. Thanks to its great location, this hotel is the perfect base from which to make unforgettable trips to Sorrento (some 5 km), Amalfi, Pompeii, Positano and Ravello. 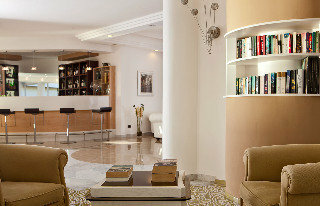 It is around 50 km from Naples airport.This air-conditioned beach hotel comprises a total of 65 rooms. Facilities on offer to guests include a 24-hour reception, a hotel safe, a TV room, a lift, a hairdresser, a reading room, a bar, a restaurant, Internet access, a garage and a car park. This establishment offers, furthermore, a magnificent, fully air-conditioned banqueting hall with a maximum capacity of 200, ideal for meetings or wedding functions. Guests may also take advantage of the room service.All rooms are comfortable and elegantly furnished and come with a private bathroom with shower and a hairdryer as well as satellite TV, Internet access, a mini bar, a direct dial telephone, a safe and centrally regulated air conditioning and heating. Some rooms have a balcony with a sea view. 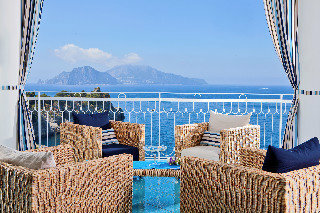 Children's cots are available (local charge).The hotel features a saltwater pool with a poolside snack bar overlooking the island of Capri and the Bay of Naples. A stroll down winding paths will lead guests to the bathing terraces where they will find sun loungers for hire. Other facilities include a tennis court and sun terrace.The restaurant serves delicious Italian cuisine accompanied by a spectacular view of the Bay of Naples. There is also a bar and a piano bar serving refreshments. This air-conditioned beach hotel comprises a total of 65 rooms. Facilities on offer to guests include a 24-hour reception, a hotel safe, a TV room, a lift, a hairdresser, a reading room, a bar, a restaurant, Internet access, a garage and a car park. This establishment offers, furthermore, a magnificent, fully air-conditioned banqueting hall with a maximum capacity of 200, ideal for meetings or wedding functions. Guests may also take advantage of the room service.There is a free shuttle bus from the hotel to Sorrento centre 5 times a day.All rooms are comfortable and elegantly furnished and come with a private bathroom with shower and a hairdryer as well as satellite TV, Internet access, a mini bar, a direct dial telephone, a safe and centrally regulated air conditioning and heating. Some rooms have a balcony with a sea view. Children's cots are available (local charge). 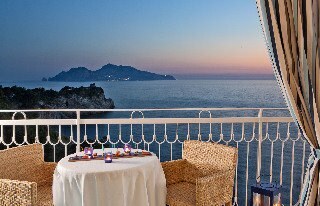 The hotel features a saltwater pool with a poolside snack bar overlooking the island of Capri and the Bay of Naples. A stroll down winding paths will lead guests to the bathing terraces where they will find sun loungers for hire. Other facilities include a tennis court and sun terrace. By car from the tollway, exit at Castellammare and proceed in the direction of the Sorrentina Peninsula. From Sorrento, follow the signs for Massa Lubrense, pass through the center and continue for another 3 km, following the signs for the hotel. The hotel is located on a broad boulevard.